In the early days of the hotel the entertainment and activities were provided for the guests with a little help from the “Social Director” who in the beginning were my parents. In the evening they would try to keep people occupied with activities, card games, and the like. Over time a regular schedule developed that was repeated each week. By the 1960’s the weekly schedule had almost become formalized so that both my parents and the guests knew what was going to be happening each night. Monday was game night, Tuesday, Bingo, Wednesday, Talent night, Thursday, Movie night and Friday and Saturday, “Professional Entertainment”. Sunday initially was a quiet night, everyone had checked in, and in Mother’s case, she had survived another traumatic day of trying to find rooms for everyone, or a bed for them to sleep in, in some cases, as well as making sure people were sitting with the people they wanted to be eating with in the dining room. Later my parents would have a one act show on Sunday evenings as part of the regular professional entertainment. Each of the evening activities was initially led by my Father, but later my parents hired a professional, the ‘talented’ Social Director, usually someone who had no talent at all, but was extroverted and could be counted on to keep things happening, a ‘tumulter’. In fact, one claim to fame was that Gabe Kaplan of Welcome Back Kotter’ was our social director one season. Initially all the activities and other events were held in the old Main House, but once the Casino was built in 1955 the evening activities shifted to it. There was a stage and room for dancing and games. This also allowed the dining room staff to set up the tables for breakfast the evening before. Most of the evening activities were family oriented so that parents and children could be together. Bingo, Movie night, and the Day Camp and Adult Talent Shows made the evening go quickly and everyone enjoyed themselves in a way that is hard to imagine given our current need for very sophisticated recreational opportunities. There wasn’t any swimming with the sharks or porpoises, there was swimming with the tadpoles and frogs. There wasn’t gambling with slot machines or roulette wheels, but there was pinochle and maj jong. Bingo night speaks for itself, but Game Night was a way for people to meet each other while they laughed at some of the simple games that people thought up. Passing an orange from one person to another without using your hands, the balloon game, where relay teams carried a balloon between their knees from one side of the room to another without it breaking. Very corny activities, but they were all part of the vacation and the Catskills. Movie night was a time to sit outside of the Main House on the patio and watch a movie on a large sheet. There was always the problem of the film splitting and having to rewind and restart it, but we all enjoyed the event no matter what the movie may have been. 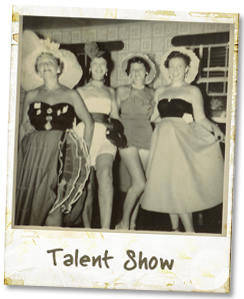 Later my parents started booking professional entertainers for the weekends of a singer and a comedian. No one like Jerry Lewis played The Brookside Hotel, but there were many memorable acts that ended up on our stage. The band would play for everyone’s dancing pleasure and somehow the days of the week slipped by until the summer was over. I remember seeing Gabe Kaplan perform….Also Freyda Payne, and a host of other acts. I even sang on the stage one night. thank you for this…We can never forget the great memories we shared with all of the Friedman clan. Even when Nate use to shut the lights when the men were playing poker. THE TEENS WOULD GET SO MAD WHEN WE TRIED TO SNEAK INTO THE SHOWROOM AT NIGHT. THERE WOULD BE A COMEDIAN TELLING ” ADULT JOKES” AND EVERYONE WOULD BE LAUGHING. WHEN THEY SAW THAT THE “KIDS” WERE LISTENING, THEY WOULD TELL THE PUNCHLINE IN YIDDISH. THE ADULTS WOULD ROAR AND THE KIDS WOULD BE “FOILED” AGAIN!